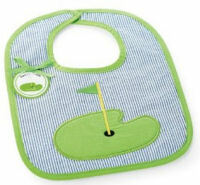 I started to design my golf baby nursery theme as soon as I got the news that were expecting a baby boy. My goal was to design a room that would easily grow with my son from infancy through pre-school. I didn't particularly care for many of the traditional themes for little boys like sports themes, choo choo trains and construction themes and being as dad is an avid golfer I decided to buy a set of golf baby bedding and fill the room with daddy's golfing trophies and using the golf baby gifts that I got at my shower as room decorations. The game of golf is one of many colors, various shades of green, bright red flags and blue water hazards not to mention the wild colored clothes that many golfers wear. After I selected some fabric that I liked, a preppy hound’s-tooth and a modern plaid, I chose three colors from the fabrics to focus on as the primary colors in the room (one shade of blue and two shades of green). My selections are seen in the the wrap around wall mural of a golf course (that I painted during my second trimester that can be enjoyed from every area of the golf baby nursery theme. I also hand painted the matching drawer pulls and made the window treatments, upholstery, linens myself. Then I added an area rug that I found in the Pottery Barn Kids catalog and placed a variety of baby golf items like baby's first golf club and baby golf shoes on top of the dresser. My baby boy's nursery theme is a bright and peaceful room and is the only golf baby nursery theme that I know of! I hope that Unique Baby Gear Ideas' visitors have enjoyed my golf nursery pictures! I am so glad you like the nursery. We moved from that house about a year ago and my son has a new big boy room now. I have the crib bedding still and would be interested in selling it. You can get in touch with me through my etsy shop www.namesakedesign.etsy.com or my blog, www.elliotthebaby.blogspot.com. I love this nursery set that you have created!! Do you make this where I can purchase it? Thank you! Join in and write your own page! It's easy to do. How? 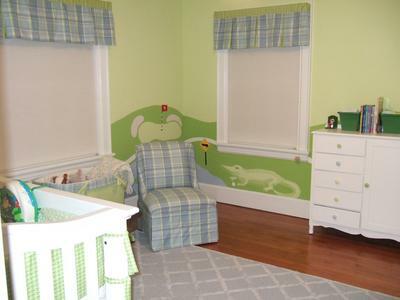 Simply click here to return to GOLF NURSERY PICTURES and DECORATING IDEAS.